The Internet has had a huge impact on the music business, in ways that no one could have predicted even five years ago. More worrying, at least for record labels, especially those selling to younger markets, like those with rock bands, is the fact that no one can accurately predict where it will be in another five years. As with many things online, the music business is constantly evolving. 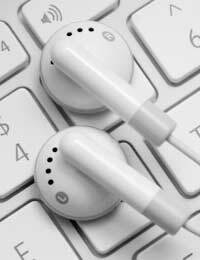 Music downloads have become so commonplace that they're now accepted as normal, not cutting edge, while Internet radio, in many different forms, has become a normal way to listen to music. The music business - that is the record labels and their associations, such as the RIAA and the BPI - have been blaming the Internet for their woes for several years. At first it was illegal file sharing through peer-to-peer networks, where people downloaded music - mostly rock, as the downloaders tended to be young - from each other without paying for it. Different organisations have pursued and prosecuted people they claim to be excessive downloaders of music, hitting them with hefty fines. They hoped that discouraging the illegal downloading of music would stop the reversal of fortunes experienced by record labels as the sales of CDs have continued to decline year on year. However, they were wrong. With the swift rise in popularity of MP3 and personal music players like the iPod - look around, it seems like everyone has one these days - the idea of legal downloads has taken off, led by Apple's iTunes store, although there are many, many competitors these days. In that regard, most people have veered away from illegal downloads. But CD sales continue to slip, most particularly in rock music, and while legal music downloads have helped somewhat, the traditional label model is in decline, especially the major labels. These days, people who are buying music think in terms of tracks, not entire albums, which is a huge paradigm shift for the industry. More than that, the accessibility of the Internet for everyone, especially musicians who aren't signed to labels, has altered things. Social networking has also affected the way we listen to and buy music. MySpace has pages for bands and musicians, with streamed tracks, many of which can be bought elsewhere on the Internet, and a number of social networks, such as Facebook, are linking on online music download stores. It's also possible to have personalised streaming Internet radio these days, selecting artists you enjoy, from rock to world music, playing through your computer for as long bas you like. This isn't downloading, but for many it's perfectly adequate, and can provide a soundtrack to the workday. In other words, Internet radio has come of age, although many stations are discovering they have to sort out legal issues pertaining to royalty payments to artists and labels. But it's possible to hear not only the BBC bust also most commercial stations on the Internet these days - and to listen to Internet radio from America, Australia, or virtually anywhere in the world as it's broadcast. It's a foolish man who makes specific predictions about anything involving the future and the Internet - in six months words can be out of date. However, it's a certainty that the whole ball game about music has changed. These days, except for a few big-selling artists, musicians are better off selling their own music themselves online ( in some cases, like Radiohead, offering a download version of a new album for whatever the listener is willing to pay). That's likely to become even more the case in the future, as musicians of all types take control of their own destinies. Record labels could become almost extinct. The Internet has changed everything about music, and will continue to do so. With things like Soundcloud, musicians are able to preview tracks to a wide audience of followers on Facebook, Twitter and more, or charge people for their music. The Internet has become such a game changer for musicians of all ages. YouTube contributes a great deal, allowing bands to upload videos and others to be creative with someone’s music. I think the internet has done so much for music, sites like youtube highlight the mulititude of artists out there that you otherwise might not see (except for justin bieber, he can stay hidden). The internet has also made music more accessible and it's great that you can download music in a flash. Social media networks also benefit music as people share diff tracks on facebook and twitter so more people get to see them.